However, going out for Spanish Tapas is diversified and fun, especially in Madrid, due to its melting-pot effect from all the migration that came from all over Spain. Madrid is recognized as one of the Spanish Tapas Capitols of Spain. Spanish people go out for Tapas in groups, mainly with family or friends. Plates are shared by everyone, this is the key why you can eat so much variety, here is an example of what a Spanish group of friends or family may order at a tapas bar to share: breaded calamari, meatballs, jamón, manchego cheese, artichokes with dices of jamón, potato salad, muscles in wine sauce, grilled shrimp in garlic etc…, this is an ambiguous example, the list of possibilities can be infinite, depending on the specialty of each Spanish Tapas bar visited. The Spanish Tapa plates don’t all come out at once, there is no rule here, and the waiter serves the plates when the kitchen rings the bell. Each person grabs their fork, a slice of bread and digs in on the culinary variety. All this is done either standing up at the bar, if there is enough space for everyone, or by joining two tables together. 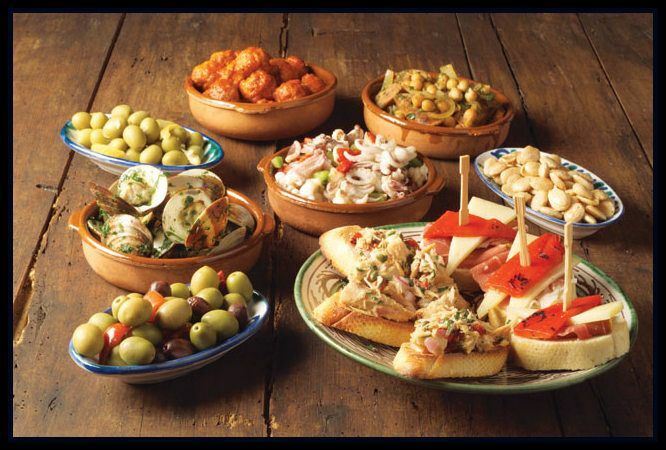 Definitely, going out for Spanish Tapas, especially in Madrid, is a true culinary-gourmet melting pot experience. Visit our Madrid Historical Tour!